Linda Morey-Burrows is the founder and Managing Director of MoreySmith. She established MoreySmith in 1993, the culmination of a distinguished 32 year career in the interior design industry. Linda’s expertise lies in interior design and architecture, most notably in workplace design. She is committed to addressing the psychological needs of the workforce in tandem with its physical and operational needs. Her clients span the full spectrum of business; from major entertainment and consumer brands to high-end residential projects. 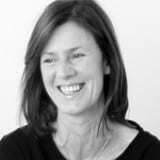 Beautifully considered architectural solutions, highly rationalised design concepts, branding and property advice are the hallmarks of Linda’s approach. She is an expert in the major refurbishment and re-positioning of used stock and heritage buildings, always increasing the commercial value of a property, in some instances six-fold. Her committed, personable and intuitive working methods ensure a satisfied, familiar and loyal client base. During her career, she has become a highly respected and notable figure within the design industry, having forged relationships with some of the most influential players in property, development, design and architecture.